It seemed impossible to enjoy another Mission: Impossible movie after the miserable experience of Mission: Impossible III. Leave it to Tom Cruise and director Brad Bird to accomplish the impossible against all odds. After directing some of the finest animation of the past two decades with The Simpsons, The Iron Giant, The Incredibles, and Ratatouille, Mission: Impossible - Ghost Protocol is Bird's doozy of a live-action coming out party. Bird injects new vitality into Mission: Impossible, delivering a rollicking, eye-popping joyride and the best sheer movie experience of the Mission: Impossible franchise. They didn't make 'em like this before! After breaking out of a Russian prison, Cruise's unstoppable agent Ethan Hunt is once again hunted by friendly forces, as the Impossible Missions Force is dismantled, with the President instituting "Ghost Protocol" (so says Tom Wilkinson, the latest in the parade of old men in suits Ethan Hunt takes marching orders from). Hunt, Simon Pegg's comic relief hacker Benji, and new additions Paula Patton and mystery man Jeremy Renner are all that's left of the IMF. Rocketing from Moscow to Dubai to Mumbai in the best 007 tradition, Ghost Protocol is thankfully devoid of the previous Missions' inane spy double talk (no mention of a rabbit's foot! ), bewildering character betrayals, over-heated plots, and those stupid masks that fool everyone (to Pegg's chagrin). Ghost Protocol is leaner and meaner but so much bigger and badder. Ethan and the Ghost Protocoled IMF must hunt down a terrorist (Michael Nyqvist, the star of the Swedish The Girl With The Dragon Tattoo films) who wants to launch a nuclear missile to destroy San Francisco. That's awesome: an actual, tangible threat for Ethan Hunt to stop instead of a computer disc or a deadly virus. In addition to some pleasing character work from Renner, Patton, and Pegg, and a terrific turn as a deadly assassin by Lea Seydoux, Ghost Protocol pays nice homage to the best aspects of its franchise predecessors: Ving Rhames cameos, not too upset that he's not risking his life this time around, while the fate of Ethan's wife Michelle Monaghan is deftly dealt with. Bird utilizes IMAX to the nth degree, showcasing astounding action set pieces, such as the centerpiece nail-biter of Cruise climbing the world's tallest building, the Burj Khalifa, in Dubai with just magnetic gloves. 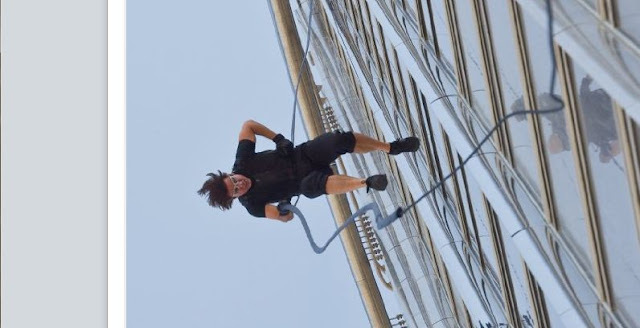 The noticeably older, weathered Hunt, who never met a building he didn't want to jump off of in the three prior films, was actually terrified at the prospect of this latest insane stunt. Ethan Hunt must be growing as a person. Finally. Ghost Protocol indeed proves nothing is impossible.